With some of the oldest and most complex geographical formations on earth, the Mountain Region of western North Carolina has many of the highest summits in eastern America. In fact, Yancey County's Mount Mitchell, in the Black Mountain range, is the highest point east of the Mississippi River. The Mountain Region consists of many mountain ranges, including the Blue Ridge, Black, Great Smoky, Balsam, and Nantahala Mountains. This beautiful land of peaks and valleys and forests and flowers was the last area of North Carolina to be settled by European Americans. The most prominent Native Americans to settle in the mountains of western present-day North Carolina were the Cherokee Indians. Their first known contact with Europeans occurred in 1540, when Spanish explorer Hernando de Soto and his men came to the mountains in search of gold. Following this brief encounter, the Cherokee and Europeans had limited contact until the late 1600s. A thriving trade developed between the Cherokee and White settlers in the early 1700s. Many Whites passed through the northwestern mountains and became permanent residents of the Watauga settlements (now in Tennessee) in the 1770s. But perhaps some of the earliest permanent White settlers in the North Carolina Mountain Region came to the Swannanoa area of what is now Buncombe County about 1784. Among these early settlers were the Davidsons, Alexanders, Gudgers, and Pattons. As more Whites immigrated into the area just west of the Blue Ridge Mountains in the late 1700s, the Cherokee who were living there moved west. As a result, White migration into present-day Buncombe, Henderson, and Transylvania Counties grew rapidly for a while. The new settlers in the Mountains found it difficult to travel the steep, rough, and muddy roads back and forth to their county seats in Rutherford, Burke, and Wilkes Counties. They had to go to these county seats to pay taxes, buy or sell land, go to court, or carry on other business. The settlers began to ask the legislature to establish new counties so they would not have to travel so far to county seats. In response, the legislature established Buncombe and Ashe Counties in 1792 and 1799 respectively. Morristown, or Moriston (present-day Asheville, was founded as the county seat of Buncombe County because it was centrally located at a major crossroad. Jefferson was named the county seat in Ashe County. The settlers who came to the Mountains were primarily of English, Scotch-Irish, and German descent. They came to buy, settle, and farm the cheap, fertile bottomlands and hillsides in the region. Some migrated from the North Carolina Piedmont and the Coastal Plain. They came by foot, wagon, or horseback, entering the area through gaps such as Swannanoa, Hickory Nut, Gillespie, and Deep Gaps. Other English, Scotch-Irish, and German settlers came from Virginia, Maryland, and Pennsylvania. They traveled down the Great Wagon Road to the Piedmont Region of North Carolina and then traveled west to reach the mountains. A small number of African American slaves were brought into the Mountain Region to work some of the larger farms. Robert Love of Haywood County, for example, owned one hundred slaves. But his case was an exception. Most farms were small and self-sufficient. Largely because traveling and getting crops to market were difficult and expensive on the rough, muddy roads, most farmers did not grow excess crops for trade and did not need slaves. The Buncombe Turnpike and Gold! Problems with travel and trade changed with the completion of the Buncombe Turnpike in 1827. The turnpike followed the French Broad River north of Asheville to reach Greeneville, Tennessee. South of Asheville, the turnpike continued to Greenville, South Carolina. The turnpike was a better road than previous roads in the Mountain Region, which usually had been steep, narrow paths. It connected the North Carolina Mountain Region with other, larger markets. Drovers were now able to drive surplus hogs, geese, or turkeys to markets outside the Mountain Region. Farmers could now use their wagons to transport crops to market. Tourists could now reach the mountains more easily. They could come in wagons, carriages, or stagecoaches, rather than on foot or horseback. Asheville and Warm Springs (now Hot Springs) became popular tourist destinations. Flat Rock attracted many summer residents from the Low Country of South Carolina, including Charleston. The discovery of gold in western North Carolina brought an economic boom to the region in the 1820s and 1830s. Burke and Rutherford Counties experienced a gold rush in the mid-1820s when hundreds of miners arrived looking for gold. During this time, North Carolina became the leading gold-producing state. However, with the discovery of gold in California in the late 1840s, most of the miners left for California. One famous immigrant who came to North Carolina during this gold rush was Christopher Bechtler Sr. He came to Rutherford County in 1830 with his son Augustus and a nephew, Christopher Jr. The Bechtlers were experienced metalworkers who had immigrated from Germany to Philadelphia shortly before coming to Rutherford County. A short time after opening a jewelry shop in Rutherfordton, Christopher Sr. apparently realized that the regional economy was hurt by a lack of gold coins for use in trade. At the time, people in North Carolina were often using gold dust, nuggets, and jewelry as currency. Few people dared to make the long trip to the United States Mint in Philadelphia, where gold could be made into coins. As a result, the Bechtlers decided to coin gold. They made their own dies and a press and struck $5.00, $2.50, and $1.00 gold pieces. Between 1831 and 1840, the Bechtlers coined $2,241,840.50 and processed an additional $1,384,000.00 in gold. Because of their success a branch of the United States Mint was established in Charlotte in 1837. During the first three decades of the 1800s, economic and political conditions were poor. A steady stream of emigrating North Carolinians passed through the Mountain Region headed for points west. North Carolina political conditions were affected by sectionalism, or conflict between the eastern and western sections of the state. At the time, each county, regardless of population, elected one representative to the state senate and two representatives to the North Carolina House of Commons. The east had more counties and, as a result, more representatives who could outvote representatives from the west. By 1830 the western part of the state had more people, but the east continued to control the government. Calls for a constitutional convention were defeated repeatedly until 1834 when western counties threatened to revolt and secede from the state if a convention was not called. Fortunately, a convention was called in 1835. The convention reformed the state constitution and created a more democratic government. The east would continue to control the senate, whose members were now elected from districts. These districts were created according to the amount of tax paid to the state. Because the east was wealthier and paid more taxes, it had more districts. But the west would control the population-based house because it had more people. Since neither the east nor the west could now control the entire government, the two sections were forced to cooperate. These changes benefited the western part of the state. It was also during this period, in 1838, that the federal government forced a majority of the Cherokee in the region to move to present-day Oklahoma. Thousands of Cherokee died in the journey west. Although a remnant of the Cherokee were able to stay behind, Whites soon began to settle on the Cherokee land, which was fertile and cheap. By the 1830s, transportation in the Mountains had improved and conflict between the east and west had decreased. But the Mountain Region remained relatively isolated for another fifty years until railroad lines reached the area. Wilson, David. Asheville, North Carolina. September 27, 2011. 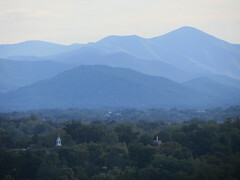 "Blue Ridge Mountains." Located at http://www.flickr.com/photos/davidwilson1949/6247361910/. Accessed March 5, 2012. Library of Congress. "Hernando De Soto [no date]." Located at http://www.loc.gov/pictures/item/2004671914/. Accessed March 5, 2012. Library of Congress. "1. U.S. Route 250 grade separation structure. This reinforced concrete, rigid frame structure was built in 1941. Its relatively flat arch provided maximum useful clearance in a short span and the physics of the design eliminated the need for extensive abutments to contain the thrust of traditional arches, making it ideally suited as a grade separation structure. BLRI designers made extensive use of theses bridges for crossing small streams and creeks, and grade separation structures, ornamenting them with a rustic stone facade. View is of the south-southeast elevation. - Blue Ridge Parkway, Between Shenandoah National Park & Great Smoky Mountains, Asheville, Buncombe County, NC." Located at http://www.loc.gov/pictures/item/nc0478.photos.345701p/. Accessed March 5, 2012. Library of Congress. c. 1909. "On the Indian reservation, Cherokee, N.C. Located at http://www.loc.gov/pictures/item/2007662508/. Accessed March 5, 2012. Thank you for taking the time to leave a comment on the NCpedia site. If you have questions or need information, please reach out to us. We are happy to help. The email address to our reference staff is slnc.reference@ncdcr.gov. Thanks to this article I'm learn more about my family's roots.